DON'T GO GREEN, "BEE GREEN"!! This is a fun item. This tote bag is Large sized, approx. 16" x 15" x 4". all seams are reinforced, and built for use. 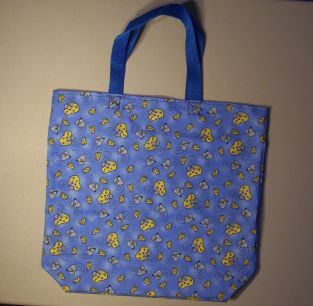 I have used tote bags for over 30 years and know they need to be tough for continued use. CUTE!! While this bag is more of a tote, it could be used as a purse, rat carrier, tote, to hold your rat items in your rat room, to use as a "rat diaper bag" for going places with your rattie, or any number of things could go in this "BEE GREEN" rattie bag. You could machine wash this bag, but I would let it air dry.